The top is so much better than the bottom. 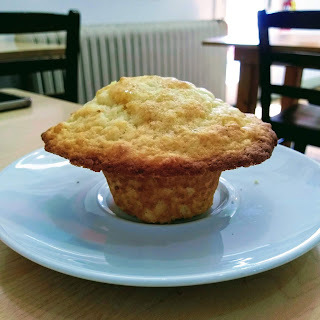 In muffins, the top is better because of the wonders of caramelization, and because that’s where it’s the easiest to put on ingredients like chocolate chips, glaze, fruit peeling, cream cheese, or what have you. The bottom of muffins are just okay in comparison. It’s not surprising that there are many products that are designed to give people only the delicious muffin tops and not the less appetizing muffin stumps. In posters, the top half is better because it’s sitting at or above eye level. The title is above eye level, which is important because it moves the title above most people’s heads so it can be seen from a long way away. The space underneath the title sits right around typical eye levels, and that’s where people look the most. Put as much of the good stuff on your poster in that top half. Your big, important question, hypothesis, or prediction. Your sexist, biggest result. Your bold interpretation or conclusion.